"Very smooth, well supported, great for assessing candidates"
assessing candidates before inviting to interview, as the recruitment partner we don't have the technical proficiency to test candidates for their coding ability. Testdome, for us, is the perfect solution to this and further allows us to easily share the results and code output from the test with the hiring team with the expertise. "Impressive technical recruitment screening tool"
Programming questions on TestDome are backed by a software compiler which builds and then executes the code in the candidate's answers, and unit tests are used to determine the correctness of their code. And custom questions can be created, with custom unit tests or multiple-choice options, allowing for automated scoring of sophisticated questions covering any manner of concepts in the chosen programming language. The quick test is limited to just fifteen minutes, beyond which the considerably pricier standard test must be used. This can limit the quick test to a choice between a set of multiple-choice questions, or a single substantial live coding question, with insufficient headroom to include both. Consider whether rigid, automatic scoring is appropriate for your recruitment screening purposes. Even in programming questions, sometimes a user will fail the unit tests due to minor syntax problems, but a manual reviewing of their code attempt reveals that they have problem-solving skills which make them worthy of progressing to the next stage of recruitment. If possible, have someone review each candidate's completed test submission, to salvage promising prospects who have failed to satisfy the automated scoring. TestDome works well in providing an initial screening process for technical candidates, giving a standardised test process and largely automated scoring, with enforcement of a strict time limit for each test. This is a great improvement on our old process of sending out questions by email and having to manually check the time taken, and manually (and somewhat subjectively) score the answers. "A great testing service that saves us time and improves our hiring process!" I like the database of questions that already exist, and that there is a wide variety of categories to choose from. We have used TestDome to create tests for several different positions, and it's nice that we can do that from a single solution. It's also really great to see the answers, especially programming questions and see how long it took the candidate to answer each question. And if they got the answer incorrect, TestDome shows what the code could have looked like to be correct, so we know how far off the answer was from being correct. There's not much I dislike because the site is fairly intuitive and user friendly. Maybe one thing would be the ordering of questions on a test which only allows you to move a question up/down one position at a time. So maybe making questions draggable to re-arrange positions quickly would improve the user experience. Since we have started using the service, they appear to have added new categories and questions to their database of pre-defined questions to choose from, which is great to see! The primary business problem we set out to solve, and then found TestDome to solve it, was a way to test a candidates programming skills before the phone interview and live interview stage. We were spending a lot of time doing phone interviews and then a video conferencing interview which ended with a love coding session, only to find that many candidates could not solve the coding challenges very well that we gave them. Since implementing TestDome, we are now able to test a candidates coding performance before moving on to a phone interview and then video conference interview, saving several team members time in our business. Thank you for your review. You are completely right about up&down vs drag&drop reordering and we'll fix that. I'd like to expand on your comment about our adding new categories and questions to our database. Our stats show that for the last three years, we've added 22 new testing domains and 450 new questions (in new and existing domains). Update: Question reordering has been reimplemented using drag and drop. "Easy to use and efficient for testing developers of different levels"
We are using TestDome for 5 months already and fully satisfied with the outcome. As I like the tool a lot, here are some recommendations. It would be really useful to add test score straight after test status on https://www.testdome.com/my-candidates. Also add "export report" feature to that page. Technical testing for Java Developers, grading them by their professional level. For each test we set different passing grade, for example we consider 50% as passing for specialist level, while experts require 90%+ test score. "Great tool for testing new developers!" TestDome does exactly what it says it will do, nothing less, and nothing more. It's easy to start adding features to a platform like this, but with the business I run, I prefer to have my own HR channels/funnels, and use TestDome as an external, reliable testing platform. In earlier versions of the platform I would get to a weird flow or a broken button, but in all reality - TestDome is a polished tool today. I don't have any pet peeves at the moment. We decided to give them a shot. It's fairly low risk to try it out, and worst case would be to lose some time. TestDome wasn't something we sought out, rather, a competitor of theirs was giving us horrible experience, and we looked for an alternative. And it worked out great! We've been using them for 2 years now without any issues. Would recommend. Testing new software developers, and it's been really easy to filter out (not to say: eliminate) developers who can't code their way out of a paper bag. I'm not even talking about a typical "bubble sort" challenge, I mean - people can't even code two nested loops, and call themselves senior devs. Saved bunch of interview time this way. Most candidates respond well to technical testing over pure interviews. Loading custom questions is time consuming (web interface) and there is no batch interface. We'd also like to take premium questions and clone and tweak them. They once deprecated a premium question, and I had to setup a new test as a result. Interviews are both time-consuming, and not a reliable gauge of a candidate's technical ability. Technical testing saves time and money (the cost an hour long interview), and provides a unbiased comparison of candidates. It also provides a good discussion point for the interview. "Excellent tool to create custom assessments and administer them as part of an interview"
The ability to host custom questions on their platform that remain private to our company, but are just as easy to add to assessments as their standard questions. It is frustrating that candidates have to verify their email address. We administer tests on site, and we would prefer that the candidate does not have to pull out their phone to receive the test link. This was a recent restriction added in the last 6 months. It should be optional. We found this service to be the best of the available products that offer the ability to upload custom questions, create custom tests, and the ability to use the product as a self-service (although their customer support is great too). We are validating a candidates programming abilities after they successfully pass our online aptitude test. We use TestDome to administer coding questions that we offer as part of our second round interviews. Additionally, let me shed some light on the feature you dislike. When accepting remote candidates via test URL, some candidates misspelled their email address basically preventing users from getting in touch with those candidates. After we introduced candidate email verification, we immediately got the feedback from users such as yourself who are using test URL for on-site testing that this is an annoyance to them and their candidates. Within a couple of weeks of receiving this feedback, we released the switch that users can use to disable candidate email verification. Go to test URL settings on your test and you will see the switch there. "A simple and efficient tool for the recruitment process"
We have migrated from a different vendor due to their stubborn pricing policy, and are very satisfied with the flexibility, ease of use and customer care at TestDome. Could use a larger pool of pre-created tests for the different languages, but other than that we are satisfied with the services. Our recruitment process was lacking hands on programming challenges. Most of the other providers give you a testing platform with a pre-defined set of tests, that are long and tedious, and do not measure the coding skills well - TestDome has a great set of short tests you can link up, so the actual level of the developer can be measured more accurately. Thank you for your review. We're happy you recognized our focus on short and relevant questions. Over the last year, we've focused a bit more on extending our question database by adding new testing domains (Angular, TypeScript, Linux, Oracle PL/SQL, Data science, Quality Assurance, Project Management, Accounting and Finance) but about a month ago we decided to extend our investments to adding additional questions to existing testing domains as well so I'm sure you will see significant improvement over the next year. "Great tool for technical assessments!" We have been using Test Dome for about 2 years, and we love the flexibility -- we can either find or write our own questions related to many different roles within our company. We also like that the tests can include specific answer questions and/or open-ended questions. The billing process is a little confusing: each time I reload my account it feels like there's a step that I just can't see until it's too late and I've made a mistake. We are assessing candidates earlier in our hiring process. This means we can spend more of our interview time on better candidates, and in conversation about their experience, maximizing their time as well as ours. "Great testing platform for developers"
The platform is very easy to use, and allows our development team to create it's own test to evaluate potential new developers to our team. The support from the TestDome team is great as well, they are very responsive and seem to be constantly trying to improve the product. For the most part TestDome meets all of our needs. There are a few minor things that would make the product better like being able to remove candidates from the completed test list that did not pass or are no longer under consideration. This tool is helping us to evaluate potential developers as the look to join our team. It gives us a snapshot of their development and coding skills before talking to the development team. It has streamlined our process, and given us a much higher quality developer. Regarding "being able to remove candidates from the completed test list that did not pass or are no longer under consideration", you can achieve that by utilizing passing score in combination with manual pass/fail actions. The way how we do it for our candidates is that we set a passing score to something we find reasonable and then evaluate all candidates above that score and a couple just below and manually switch them from pass to fail or other way around. That way you can keep candidates you are pursuing further in the pass section while candidates who failed the test or are no longer in consideration will be in the fail section. "Great tool to accelerate any process." It generates a great flexibility in the working hours, the administration is really fantastic for the business, employees and customers, improving competitive incomes. It's a little expensive. We agree with the cost because they have provided the content. It is good, saves me a lot of time doing the first step of a tech interviews series. It allows us to evaluate a rush of curriculum to find candidates with the skills we are looking for. Our CTO calculates that you save at least 2 hours compared to before. it is a great benefit. "Get the right candidates for your organization"
The use is simple. The grip of the tool is fast. The interface could be a little prettier. A function to search a candidate with his first name or his name could be appreciated. The use of testdome allows us to evaluate the fundamentals of our candidates (developers) and meet only those who have a conclusive test. This allows us to save time and use this exercise as a basis for exchanges once we meet them! The score of 3/5 indicates there might be other things you are not thrilled with and I'd really like to hear them either on here or on support@testdome.com. Pricing is very reasonable. The platform is great for conducting multiple choice quizzes. We filter a lot of bad candidates with a short multiple choice quiz on TestDome. You can't modify the questions on a test after somebody takes it. It's inconvenient to clone an entire test for a minor change. We also don't like the fact that you a coding test is tied to a particular programming language. Hiring is hard and engineering hours are expensive. TestDome helps us automatically screen many candidates upfront. Our engineers no longer have to spend 30 minutes conducting the initial screening call. Additionally, we now screen all of our candidates more or less the same way. First of all, thank you for your review! Since you talk about modifying questions, it probably means that you are using your own custom questions. Both things you listed as downsides were tough choices where there was no clear winner. When it comes to modifying questions that are in use, even minor changes (e.g. changing "an" to "the") have a significant impact on candidate's understanding of the question. And in general, users (and we) rarely modify question without a reason (e.g. candidate feedback). We sided with it being unfair to candidates to directly compare candidates who were solving different versions of the questions. I understand that technical implementation (forcing users to clone a test) is not ideal and is something that we will look into in the future. The simple process of adding new candidates. It doesn't ask for too many information about the candidate when the invite is sent. The simple option to share the test result quickly. It is frustrating that candidates have to pull out their phone to receive the test link. Other then that the system is doing exactly what we want. It increases effectivity and efficiency of the recruitment process by testing candidates before calling them for an interview. It is cost effective and saves our time. "Using TestDome as part of the University Admissions process"
I did a quick survey of automated programming tests available and this seemed like the best one. The staff were very helpful when i was setting up the process and continues to provide good support all along. using this software has been really effective in our admission process. i believe that just the fact that we apply this test has shielded us from quite a few bogus applicants. "Awesome tool for screening programmers"
Tests the applicant's ability to write real code. Results are scored with unit tests. We learn a lot more about candidates when they write code than when they answer multiple choice questions. Screen out unqualified programmers from our applicant pool. 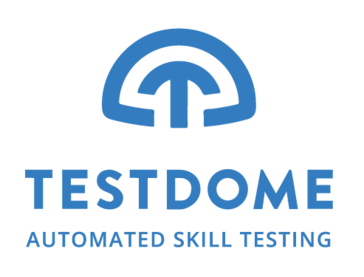 We use TestDome to go from 1,000 mostly unqualified applications to 50 people who can actually code. "Great tool for our SaaS business"
I like the pricing structure given the inconsistent flow of our needs. It makes more sense for us to pay "a la carte" vs. a fixed monthly amount. The tests are comprehensive and candidates see them as fair representations of their skill. I would like to see a larger database of tests, especially with newer technologies. The problem we are solving is establishing a solid first gate for Engineering candidates to pass before they burn a significant amount of team resources during the interview process. "Quick and effective way to test our developers!" The facility to create new tests and the quality of the exercises, who are always up to date with the new technologies. I think test dome is the tool that better fit with our necessities. The right price for the right tool to recrtuit the best developers! We have the chance to test our "dev candidates" very quickly with the right exercises and with a tool that examines in a reliable way the results. We've been using Testdome for a while now and its flexibility comes in hand. We wrote some of our own questions, creating our own validations and tests, not being tied only to the challenges proposed by the platform. Even though we have a high flexibility on creating tests, it misses ways to evaluate whole projects, complex scenarios or even web solutions. We use it in our recruitment process. To standarize the Test we use around the continent in only one tool centralized. Test Dome has become a vital part of our recruitment process within our development sector. Being able to set varying difficulty levels for testing potential candidates into different roles has been really helpful. Nothing at the moment. The system is doing exactly what we want. Saves us a lot of time by understanding someones capability in line with what their CV says. "a very easy and intuitive platform to test candidates' technical skills"
The platform is very easy to use, our team can create a live coding test with any set of skills and email it to candidates in few minutes. We also really appreciate the customer care. It would be nice if we could use a larger pool of pre-created tests for the different languages. A great tool for an initial screening of candidates. Before a candidate comes for an interview we know if they can do the job or not. In this way we can save time and money. "Great tool, UI is amazing." Thank you for your positive review. If you want to prevent running out of the credits, you can turn on auto top-up in the account settings which will automatically top up your credits when you use 90% of your current pack. "Great tool, excellent value for money"
Simple interface, easy for both recruiter and candidates. Very easy to create test profiles for different positions. Ability to review thought process of candidates. Would love to have an option for random selection of questions from a pre-defined pool. "Good experience for our business"
Product is simple to use, intuitive, and provided a great solution as a platform for our business. I wish inquiries could be answered more quickly. Some features or updates are a bit hidden. We shortlist developers very easy to interview. Although I'm not completely sure I understood what exactly are you missing but let me tell you what we do have in the area of branding and integration. In terms of branding, we offer co-branding (adding your company's logo to emails sent to candidates and candidate's part of the system). We also offer complete white-labeling. In terms of integration, we have an API which you can use to automate inviting candidates to the tests you have on your account and getting those candidates' results into your applicant tracking system. * We monitor all TestDome reviews to prevent fraudulent reviews and keep review quality high. We do not post reviews by company employees or direct competitors. Validated reviews require the user to submit a screenshot of the product containing their user ID, in order to verify a user is an actual user of the product. Hi there! Are you looking to implement a solution like TestDome?